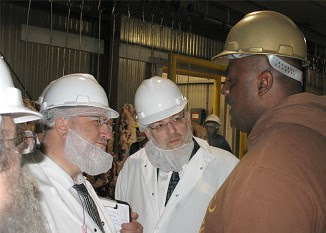 Rabbi Pesach Lerner, center, the executive vice president of the National Council of Young Israel, speaks with a worker at the Agriprocessors plant in Postville, Iowa, on July 31, 2008. NEW YORK (JTA) -- In what could result in the first charges to be brought against upper management at Agriprocessors, the Iowa Labor Commissioner's Office has sent dozens of alleged child labor violations to the state’s attorney general for prosecution. Completing a months-long investigation of the Postville-based company, which is the country's largest kosher meat producer, the labor commissioner found 57 cases of alleged child labor violations, Iowa Workforce Development announced Tuesday. Agriprocessors responded with a statement saying it was "at a loss to understand" the labor commissioner's referral, noting that the company had cooperated with the investigation. The company also claims the government denied requests to identify underage workers so they could be terminated. It asked the public to keep an open mind before making any judgments. Several documents provided by Agriprocessors to JTA show the company responded to requests for information from Iowa officials conducting their investigation; the first request was made in January. The documents include a request that the labor commissioner reconsider its decision not to disclose the names of suspected underage workers employed at Agriprocessors. The company also provided copies of termination documents for three employees who were fired after they were found to be underage. A fourth employee was fired for insubordination after she was asked to produce a birth certificate and became belligerent. Neil told JTA that in April, when Agriprocessors made the request for the names, his office only had general reports of child labor violations without specific names. The labor commissioner's referral comes as Agriprocessors continues to try to restore its production capacity and revive its public image in the aftermath of a May 12 immigration raid, which the government says was the largest of its kind in U.S. history. It also comes just days after a group of 25 Orthodox rabbis visiting Postville on a trip paid for by Agriprocessors issued the company a clean bill of health. The immigration raid led to the arrest of 389 illegal workers, a number of them underage. In the raid's aftermath, employees unleashed a flood of allegations against their former employer, charging that they were subjected to harsh working conditions and sexual abuse, among other complaints. The company has denied the charges. The Orthodox delegation reported this week that the Postville plant bears no resemblance to its image as a place where safety lapses are routine and workers allegedly are abused and underpaid. In the course of their one-day visit, coordinated through the National Council of Young Israel, an Orthodox synagogue association, the rabbis toured the plant and met with its recently hired compliance officer, the mayor of Postville and a Presbyterian minister. Some of the rabbis also met with representatives of St. Bridget's Catholic Church, which has taken the lead in ministering to families affected by the raid. “At this point I don't see any reason why someone should not buy things from Agriprocessors,” Rabbi Daniel Moscowitz, the regional director of Chabad of Illinois and the president of the Chicago Rabbinical Council, told JTA. “They run a very impressive operation. They're very dedicated to making sure that everything is being done in the most appropriate way possible." To date, no senior managers have been charged with a crime, though a grand jury investigation is ongoing. Two supervisors have pleaded guilty to assisting illegal immigrants in the procurement of false employment documents and a warrant is outstanding for a third. While the visiting rabbis were careful to point out that they have no personal knowledge of what transpired before their arrival, they expressed confidence that current conditions at the plant contrast with its checkered reputation. Participants told JTA there were no restrictions placed on where they could go in the plant and with whom they could speak. Several conducted their own interviews with employees, who reported that they were treated well and were provided with ample safety training. In the eyes of the company's critics, and even some Orthodox rabbis, the fact that Agriprocessors paid for the trip rendered the rabbis’ conclusions suspect. Neither of the national council's two news releases regarding the trip disclosed that Agriprocessors had footed the bill for the rabbis. “If they're going and being paid by Rubashkin, then that should be forthrightly disclosed,” said Maury Kelman, a lawyer and Orthodox rabbi who has led congregations in Israel and New York. Kelman said Jewish law, or halachah, insists that rabbis involved in such matters do everything to avoid even the perception that their judgment could be compromised. Lerner rejected the suggestion that the rabbis' impartiality might be compromised. "Give me a break," Lerner said. "To impugn the integrity of 25 people is out of line." The rabbis also were criticized for not meeting directly with former workers, who have lodged the harshest complaints against the company. They did, however, meet with one of their advocates, Paul Rael, the director of Hispanic Ministries at St. Bridget's. Lerner said his group was expecting to speak with the workers and was surprised to see that none were present for the meeting. The rabbinic delegation, which dwindled to four for the late-afternoon meeting with Rael, sought to establish itself as a conduit between the church and Agriprocessors to discuss outstanding problems. Regarding past allegations, Lerner said he had asked that a file of worker complaints be prepared and that he would take up the issue with Agriprocessors. But Lerner stressed that the main issue now should be how to move forward. Rael said he won't be ready for that until various problems, like employee back pay, are worked out. “The minute that I got through giving my little dialogue, they said, 'That's the past,'” Rael recalled. “I said, 'Yeah, but the past is what created the problem.' If their intent is to move forward, I can't move forward until this issue is totally, totally done."